Cleaning compact discs or cleaning other types of optical discs is sometimes all that is required to make these discs play properly. The presence of dirt, debris, fingerprints, etc., are often the reasons why CD, DVD, and Blu-ray optical disc media do not function as expected. The laser light that reads a disc needs to shine through the base of the disc without interference in order to read the information layer deeper into the disc structure. If the laser light beam is disrupted by dirt or other contaminants on the base, then problems are likely to occur. The effect of debris on discs is greater on higher density formats than on lower density ones. This is because a speck of dirt of the same size will cover more information on higher density formats, where the data spots are smaller and closer together. The image below illustrates this. 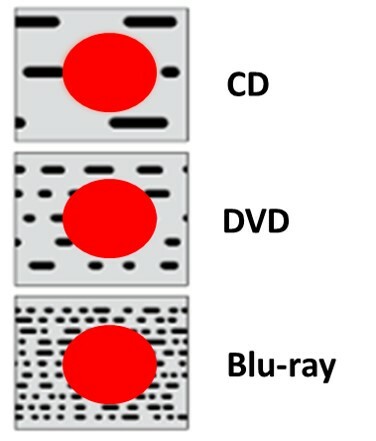 The pit density or the data density of the three main optical disc formats (CD, DVD, Blu-ray) is represented by the black spots. The red circle represents a speck of dirt. Therefore, Blu-rays are affected more than DVDs, which are affected more than CDs. To deal with this, DVD and Blu-ray formats have more powerful error detection and correction systems. In addition, Blu-rays have an additional layer on the base of the disc that is designed to repel dust, dirt, and fingerprints. Fortunately, all that is required in many cases to restore performance is a good cleaning. However, cleaning compact discs needs to be performed properly. If recommended cleaning procedures are not followed then damage to the disc may occur and even more playability or read problems will result. Cleaning compact disks is fairly simple but depends on the type of contaminant present. 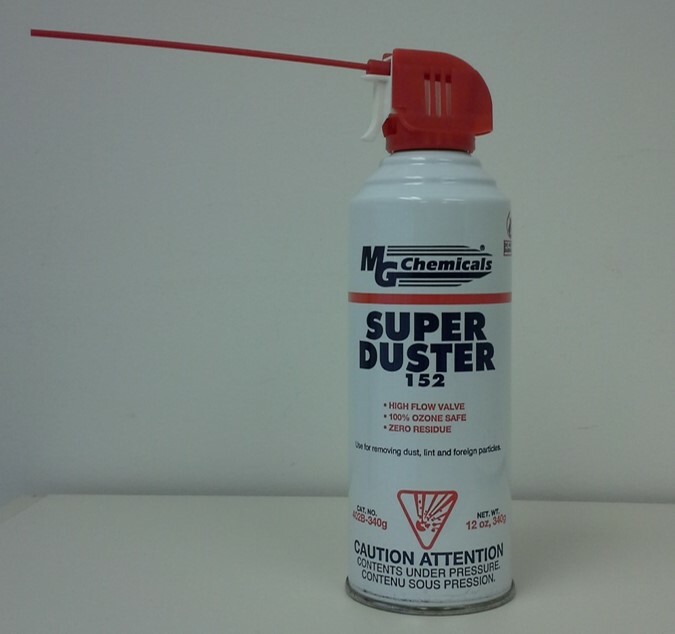 For loose dust and debris, use a compressed air duster to blow the contaminants off of the disc. Note that care should be taken when using this procedure to clean the top of the disc (label side). If there is any label flaking or slight delamination of the top layers, the force of the compressed air will cause the layers to blow off of the disc and ruin it. Debris on the top side of the disc will not interfere will the laser light beam reading the disc, but the removal of the debris will ensure the equipment does not get contaminated. If the debris cannot be removed with the compressed air, then wiping is required for cleaning compact discs and other optical disc media. Wiping to remove contaminants should only be performed with a soft non abrasive cloth. Some cloths are sold especially for wiping compact discs. An example of these cloths is shown in the photograph below. These wiping cloths are very soft to limit scratching as much as possible and do not leave behind any lint. Use of any other type of cloth such as tissues or paper towels or other fabrics are likely to be too abrasive and lead to scratching of the disc. When cleaning discs, the wiping should be only as hard as required to remove the debris. The wiping should be in a radial direction starting from the hub and ending at the outer portion of the disc. The wiping should not be in a circular direction. The reason for this is that in case the disc is scratched with wiping, a radial scratch is much less problematic than a circular scratch when it comes to disc performance. This is primarily due to the error correction system associated with optical discs. Circular scratches follow the direction of play. Therefore, this creates many errors in sequence, which is problematic for the error correction system. If a radial scratch is formed, this is more of a random error situation and the error correction system can readily deal with this scenario. Cleaning discs is often required because of fingerprints on the discs. Fingerprints can be very disruptive to the laser light that reads the disc. Fingerprints may be removed with dry wiping with a soft cloth but this may only spread around the grease and not remove it. A wipe with a wet cloth or soapy wet cloth may be required. After the wiping, the disc surface can be blotted dry with a clean soft cloth and then any lint can be blown off gently with a compressed air duster. Blotting prevents the formation of water spots. Immersing the disc completely in water for cleaning compact discs should be avoided if possible. However, if there is a lot of greasy dirt/debris on the disc and the disc is intact and not damaged in any way, then immersing the disc in warm soapy water (dish washing liquid is fine) can be used to clean the disc. Once again any wiping should be in a radial direction. Ensure the disc is completely dry before playing it.